“Rhetoric is the use of knowledge and understanding to perceive wisdom, pursue virtue and proclaim truth” (Leigh Bortins, The Conversation, 38). If I had to sum up my favorite memories of the elementary homeschooling years, it would be “hot cocoa and buttered popcorn days.” Those were the afternoons where we would sit on the couch with books in hand, reading for long swaths of time and enjoying the learning adventure together. I am not saying this happened all the time—but when it did, it was a joy. Now if you asked me what my favorite moments are in the high school years, I would say the surprise of amazing conversations. I am not sure why this is such a surprise. If I have been following along in the classical education model, we are right where we should be, in the heart of the lively discussions so fundamental the development of my high schooler’s budding rhetorical skills. The three elements of the classical trivium are the art of grammar—typically emphasized during the elementary age as students love to memorize lots of information, the art of the dialectic—stressed during the middle school years when students enjoy making comparisons and connections, and lastly the art of rhetoric—explored when high school students relish the opportunity to put the ideas together, draw out truths, make the ideas their own, and teach them to others. In The Conversation, Leigh Bortins reminds us that we can look at any topic of learning and use five key tools to foster dynamic conversations. These are the five canons of rhetoric, originally used by Aristotle, and they offer an organized way to think about and break down any subject or idea. They allow us to look at any subject together with our students and find truth, beauty and goodness in the process. The best part is you can use them every day, for any topic, as a way to have great conversations with your child. 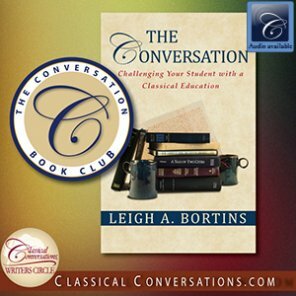 Mrs. Bortins shares, “These foundations make guiding your child’s classical education through high school not only possible but also rewarding beyond your wildest imagination, especially if the coursework is surrounded by conversations. As you learn the art of rhetoric alongside your high school-aged students, you’ll be developing the skills to have a rewarding and fruitful conversation about any subject you encounter” (33-34). The five canons of rhetoric are invention, arrangement, elocution/style, memory and delivery. At first glance, it appears that these five tools would only apply to writing and speaking. In the months ahead, we will walk through each subject and look at how we might apply the five canons. But first, let’s look at each of the five canons of rhetoric and how to make them part of the homeschooling day. “Before your student begins to speak, write or create something, he must first identify the truth he wants to present and the audience to whom he will be communicating it” (43). Invention asks the question, “What should I say?” or “What do I want to share?” It draws from a big pot of ideas that your student has already learned in the earlier years or identifies areas for research now that he has a desire to know more about the subject. I think this is one of the best parts of learning together. You may start with questions like “What do you already know about this?” or “What would be the most interesting thing to discover about this idea?” This tool is where curiosity, discovery, and love of learning intersect and are filled with possibilities. A big whiteboard and large sheets of paper can become the ticket to discovering new places in your student’s thinking. “After determining what he wants to say, your student will need to decide in what order he should say it…..Studying arrangement in this way allows you to talk about choices and consequences with your student. This train of thought should also lead your student to consider how he arranges his own life” (44). Arrangement asks the question, “In what order should I say it?” It encourages your students to present their ideas in a manner that persuades, informs, and gives the best thoughts. It is drawing from the big pot of ideas, then choosing a logical order to introduce or advance these ideas. This is their chance to practice organizing their ideas in a way that not only makes sense, but accomplishes what they set out to do. “Elocution may be as simple as showing compassion for the reader by proofreading an essay or as complex as creating an extended metaphor in a poem or putting a fine glaze on a piece of pottery….Like anything else worth doing, elocution requires practice and the willingness to do it badly at first” (45-46). Elocution asks the question, “How should I say it?” It encourages your students to select the most fitting words and expressions of ideas that demonstrate truth, beauty and goodness. In my homeschool, this is the most difficult part. It takes lots of practice to get really good at drawing out the choice words and expressions. But it is time well spent. As students learn how to present their thoughts in clear, meaningful ways, they are honing important life skills. “Great orators memorized their words so they could throw their entire bodies into presenting the speech and speak naturally” (46). Memory asks the question, “How should memory inform my presentations?” It is not just about memorizing a speech, an idea, or a collection of facts. It is looking at the material to be shared and seeking ways to make it memorable to both the speaker and his audience. Your students are drawing from what they know in order to share what is true. Like the great orators, they should seek to share their ideas comfortably, confidently, and naturally. “As our student prepares to engage the world in more ways than ever, with less supervision than ever, you as the parent will have the opportunity to talk to him about the way he presents not only his words, but also himself” (47). Delivery asks the question, “How should I present this truth in speech and action?” This is the heart of the high school years as we are learning how to put all of our ideas and actions together to present in the larger classroom, the world. Practicing the expression of spoken and written ideas with your students is one of the greatest gifts as a homeschooling parent. As you hear and see their ideas develop day by day, you are privileged to get a glimpse into the person they are becoming. The great news about the five canons of rhetoric is that they are probably already a natural extension of what you are doing in your home school. If you are not having rich conversations with your high schooler, look for the opportunity to make that connection. Set aside a time in your day when you are not rushed or distracted, when you can pour yourself a cup of tea and listen to their ideas. Make it a moment of encouragement for them by letting them share their thoughts fully. If you want to make it even more delightful, pop some buttered popcorn and make some hot cocoa. These precious days are going fast; have some beautiful conversations and make some memories today. What do you enjoy most about homeschooling in the high school years? What do you find the most challenging about high school at home? What are your thoughts about the five canons of rhetoric? Does this feel like a natural extension of how you already homeschool? How might you use the five canons at home? How might you foster great conversations with your high schooler? What could you do this week to create a loving memory in your home school? A special snack, a hike with your child, a date for coffee or lunch, an afternoon at a museum? Consider a chance to connect with your child in a rich way this week. Cara McLauchlan is a writer and homeschooling mom from Raleigh, North Carolina. She has been homeschooling since 2010 and has served as a tutor for Foundations levels up through Challenge B.